В мае месяце в The Ton Challenge blog мы играем в крестики-нолики ;)) На мой взгляд, это ооочень интересное задание!!! It's so fun and interesting!!! Я выбрала: Открытка-Шейкер - Глиттер - Раскрашивание без границ. 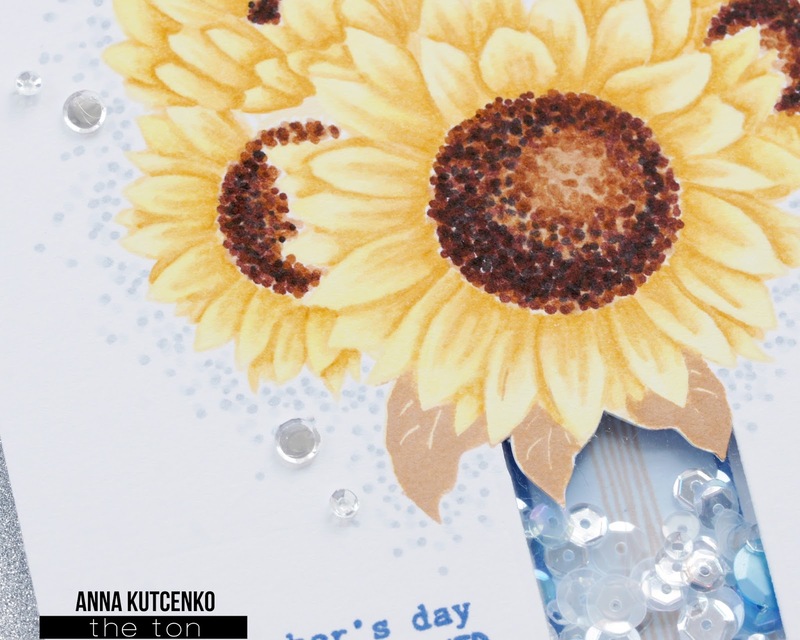 I created it using Sunfrowers Bouquet stamp set, Fresh Cut Sunflowers dies and Pragmatic Wreath (sentiment). At first I cut a piece of white cardstock slightly smaller than a card front. I stamped Sunflowers Bouquet in Vanilla Frosted Cupcake ( but leaves - in Warm Hazelnut Dye) and colored it with Copic markers. 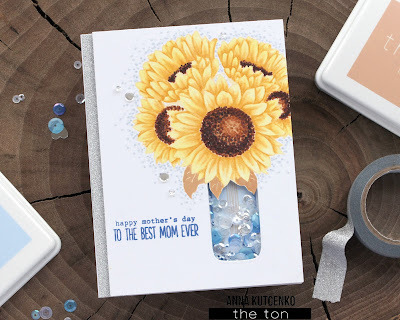 I die cut (partial die cut) the vase (window) using Fresh Cut Sunflowers Dies and adhere the acetate piece.To create background panel I stamped the vase on a piece of white cardstock using Fresh Cut Sunflowers stamp and blended it with Arctic Sky Dye. For the shaker I used Summer Skies Couture Mix. I stamped the sentiment from Pragmatic Wreaths stamp set in Miami Cool Dye. Сначала я вырезала панель меньшего размера, чем сама открытка. Затем отштамповала букет подсолнухов и раскрасила его копиками. Чтобы вырезать окно-вазу для шейкера я использовала прием частичной вырубки. Для задней панели шейкера я сделала оттиск вазы и затонировала голубыми чернилами. Далее я отштамповала надпись. Next I pulled out the Glitter Tape - Silver and put a strip down at the left of the card base. I attached the shaker panel to the card base and added some Glass Slippers Round Confetti. Я наклеила глиттер-скотч на левую сторону основы открытки и прикрепила панель-шейкер. Для украшения добавила пару пайеток. Hope I could inspire you to join in our May Challenge. Надеюсь, моя работа вдохновила вас на участие в нашем конкурсе. 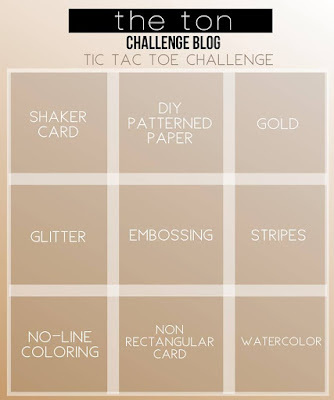 To participate in our challenge, create a paper crafting project using the rules of the game Tic Tac Toe this month! You may use any of our team’s cards for inspiration but it’s not required! 1.You must use a Ton product as the main focal point of your card or tag. 2.Display the cue word/inspiration photo on your blog post and include a link to this challenge in the body of your post. 3.You must link up your card and post to the In Links link up tool contained in this post. Enter your card by May 31, 2017 by 12:55pm EST. Для участия вам необходимо сделать открытку, используя материалы The Ton как основные. Количество работ не ограничено. Победитель конкурса получит подарочный сертификат на 50 долларов в магазин The Ton. Спасибо, что заглянули! Пока! Пока!